Ok, back to the subject at hand. So weirdly enough, I woke up 30 minutes before I had my alarm set. I had forgotten about Race Day excitement. I didn’t wake Damary, because if she was able to get sleep on a Race morning, who was I to disturb that? So I woke up and walked through my mental checklist and sat and chilled. Then it was time for her to get up and her alarm took care of that. Babygirl wanted to be awake to say Bye to Damary, so she was awake too. So Damary woke up my mom (who stayed the night) and then we both got ready. As we got to Louisville Slugger Field, we parked about a half mile away and walked to hang out inside, out of the chill in the air. We met up with a few friends who were running the race also. As the casual pre-race conversation flowed, I was paying extra attention to Damary and her body language, to see if there were any triggers to see how nervous she was, or if she was talking herself out of it (we all often sabotage our success). I will say I noticed she was loose and relaxed, but ready to start….a good level of pre-race anxiety. It was time to head out to the start line and line up amongst the other 9000+ runners and walkers. Soon the horn sounded, and it was time to inch our way to the start line. And soon enough we WERE OFF! I had told Damary I am there to run this with her (even though she kept saying I could leave her, because he thinks I would be bored going at her speed…I assured her, I would NOT leave her side), and she could take the lead on pacing to see how she handles it. One of the great side things about this was, she got a view of what it is like wearing my race shirt (Superman shirt with the girls hand prints on the back and it says, Husband, Father, Runner) and how many people make a point during the race to tell me how much they love my shirt. It was cute when she asked if every race has been like this, and I told her yes J As with all of us on the first mile of a race, she came CHARGING OUT! I know her mile pace from training, and in my 3 years of being a runner, I know how “Race Turbo” affects me, I knew what to look out for, but I didn’t want to be an overbearing coach and correct her. I wanted her to experience and learn these lessons for herself. 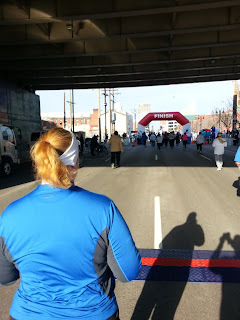 It didn’t take her long to get a little gassed…and we got to the first mile marker, and she was almost 2 whole minutes faster than the fastest training mile she had done. I asked her if I could pace her (set the pace) for the rest of the race, knowing her training and wanting her to finish strong (as is the mantra I say to the Cross Country team I coach), and she said yes. So I told her my plan on how we would handle the rest of the 2.1 miles and how it will help her run smart AND hard! She did a GREAT job, and I even pushed that last mile. I was SOOOOO proud of her! As we got towards the end and she gave that last push of everything she had left, I was humbled. I’ve been a runner and avid racer for 3 years now, and sometimes I get so caught up in PR’s and PB’s and negative splits, sometimes I forget the beauty of the human spirit in crossing the finish line. Damary helped me to remember that. To enjoy the moment. Well she finished strong, and beat any sort of time she had set for herself. Hell, she beat me and I couldn’t have been happier. The other amazing thing is, with her weight loss journey, is that she is wearing MY Reebok Climate Control shirt....I just thought that should be mentioned how DOUBLE wonderful she is! She immediately started to critique herself, and I reminded her what she just accomplished, in the time she accomplished it, would have been IMPOSSIBLE 4 months ago, and she should revel in her accomplishment. The smile on her face was undeniable. She had done it, and felt pretty good afterwards. We gathered our post-race food (which always goes to our daughters anyway, I’ve learned to give it to them after my races lol) and met up with some other wonderful friends. Then we headed back to the car and both talking about in 2 weeks is the Rodes 10K. I had already prepared her; the point of this race (in the grand scheme of her and the Half she is training for) is to get some race day experience under her belt. Her 5K pace is most likely not going to be her half marathon pace. So for the Rodes 10K and the Papa John’s 10 Miler, we will work on pacing in that sense. So I am running the Triple Crown races with her, but she is doing the Half by herself, so I and the girls can cheer her on at the Finish Line. I didn’t want her to have to share the spotlight for this HUGE accomplishment! In case I haven’t said it enough throughout this blog, I am SOOOOO proud of her! Damary, I love you, and am grateful that you brought my love of racing back to me!! I'm so proud of Damary myself... its always so exciting to see someone experience these things for the first time. She's doing so amazing... & love that you are training her & giving her encouragement with every step she takes! See y'all in 2 weeks! Inspiring as always! Great job to both of you on the 5k, and I look forward to seeing the progress as you head through the derby races!! !